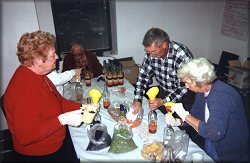 The volunteers have packed more beans into bottles of "Friendship Soup" so that the agency can launch the soup fundraiser for Christmas sales again this year. These attractive bottles with layers of colourful beans make excellent gifts. The tasty recipe for friendship soup is attached to the neck. Selling at only $6.00 each the bottles are available at several locations: the County Kitchen restaurant in Picton, Community Care office in Picton, on Tuesdays at the local office at 271 Main Street in Wellington and at the Thrift Shop on Picton's Main Street. Tabitha Kay, owner/operator of The County Kitchen will be featuring "Friendship Soup" as the soup of the day from Friday, November 23, to Sunday, November 25th. You can get take out friendship soup on those days as well. Bottles of the soup will be available for sale at the restaurant which is located on West Main Street in Picton and is open seven days a week from 7am to 2pm. Call The County Kitchen at 476-6704 for more information. Community Care's Thrift Shop volunteers will have samples of friendship soup prepared and available on Saturday, November 24th from 10am to 4pm. On the following Tuesday, November 27th, samples will be available at the Wellington local office from 9am to 4:30pm. Everyone is welcome to stop in and try the soup. Friendship Soup bottles will be available for purchase. Prince Edward Community Care provides services to assist older adults to remain living in their homes in the County. Services include Meals on Wheels, seniors' dinners, volunteer driving, help with forms, and footcare clinics. The agency is only partly funded by the Ministry of Health and Long-Term Care. Fundraising initiatives include an annual auction, memberships, tag days, and sales of the Friendship Soup. For information on volunteering, services that are available, or about Friendship Soup call Prince Edward Community Care at 476-7493 or email communitycare@on.aibn.com.